Villa Portofino offers a prestigious location and luxurious amenities. Its residents enjoy a maintenance-free lifestyle. 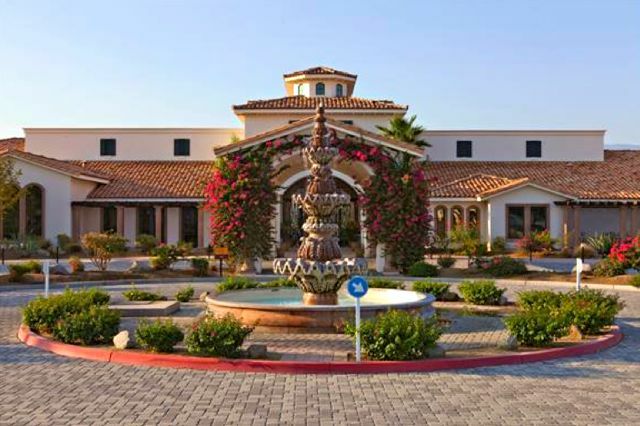 In the heart of California's Coachella Valley, Villa Portofino offers luxurious living for active adults aged 55 or better. This Palm Desert community was designed with elegant Italian styling, as well as appealing clubhouse amenities. Its prime location also offers spectacular views of the surrounding Santa Rosa and San Jacinto mountains. Villa Portofino was established in 2005, acquired in 2011 by Family Development and purchased again by Comstock Homes in 2013. Today, the community offers attached and single-family homes which may be available on either a resale or new construction basis. Upon completion, Villa Portofino is expected to include approximately 460 homes. When Family Development owned the community, attached homes were available in two models: the Cortona and Cortona II. The Cortona, sized at 1,009 square feet, includes one bedroom and one full bathroom, while the 1,610 square-foot Cortona II offers two bedrooms, a den and two bathrooms. These single-level homes are arranged in buildings with elevator access. They feature covered loggias, storage space, laundry areas and one-car garages. A sparkling pool and soothing spa with cantina offers stunning views and a quiet retreat. Comstock Homes has expanded Villa Portofino's home line with six attached models and three single-family designs. Attached homes range in size from 1,183 to 1,926 square feet. Depending on the model, they may include one to three bedrooms, separate dens, one-and-a-half to two bathrooms and one- to two-car garages. Single-family models are typically larger with floor plans from 1,895 to 2,341 square feet. They include either two bedrooms and a den or three bedrooms, two to two-and-a-half bathrooms, and attached two-car garages. Beyond its lovely homes, Villa Portofino offers a variety of social and recreational amenities, which are largely located in its 30,000 square-foot clubhouse. Here residents will find a fitness room and yoga studio, two dining areas, a game room and a 100-seat movie theater. The clubhouse also features the Dream Game Room, a facility with a sports bar, multiple big-screen TVs, pool tables and a poker room. Additional clubhouse amenities include an arts and crafts studio, a bridge room, a library and a beauty salon. Outdoor amenities also make it easy for residents to enjoy Villa Portofino's beautiful California weather. The clubhouse features a spacious patio, as well as a luxurious swimming pool and spa area. Residents can explore the community with winding walking and biking trails, or enjoy relaxing, yet challenging play on Villa Portofino's 9-hole golf course. Offering diverse homes, exciting amenities and lush grounds, Villa Portofino provides an ideal retreat for an active adult community in California's popular Palm Desert area.